Previously, on MinerBumping... We pulled back the curtain on Erotica 1's notorious bonus room, also known as the "Glory Hole", in which participants must demonstrate total faith to win big. Miner yoda knows was ganked by the New Order and found her way into the bonus room, where she transferred all of her assets to trusted Glory Hole staff. Though she didn't have any possessions, yoda's acts of faith put her well on her way. Soon, she would be rich. To prepare her, Erotica 1's volunteers wanted to first ensure that yoda was reformed. yoda was instructed to begin writing a series of EVEmails and essays on the Code. If yoda weren't grounded by the Code, she would only blow through the money anyway, making the whole exercise futile. Old habits are hard to break. 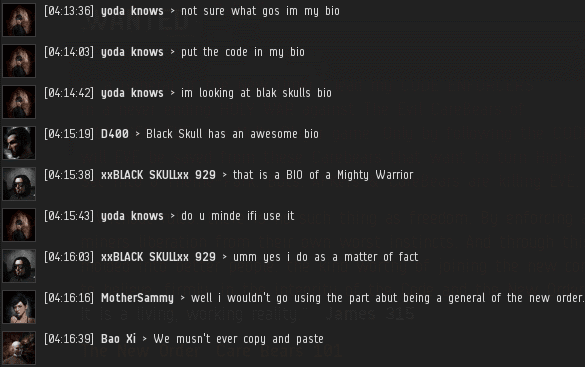 yoda considered copying Agent xxBLACK SKULLxx 929's bio. Eventually, she would come up with her own, though it was mostly copied from the text of the Code. yoda understood that her journey was not yet complete. She still needed to get paid. The bonus round began at approximately 01:50 EVEtime. Now it was starting to get late. yoda urged everyone to wrap things up so she could get some sleep. ...But it couldn't be rushed. Nothing would be worse than to give yoda her windfall precipitously. Erotica 1 filled the downtime by making idle conversation. 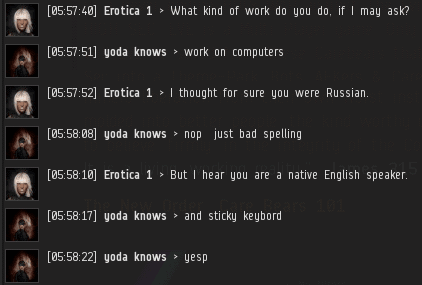 yoda's re-education continued, with Erotica 1 and her staff supplying relevant articles from Wikipedia for the lucky bonus round participant to read. yoda remarked upon the relevance of the Saint Olga of Kiev article. Next came the traditional question of what yoda would do if the entire bonus event had been a scam. Some players are unnerved by this question, but yoda kept faith. She was rewarded by being showered with isk. It had been a grueling 5+ hours, but yoda received all of her assets back plus a hefty bonus. As related in the original account of this story, she sent out EVEmails to a long list of people, including a link to a photo she had taken of herself with her face obscured by a sign reading "Erotica 1 for CMS [sic]". So the story had a happy ending. Our review showed that Erotica 1's Glory Hole was ethically spotless and pure as snow. However, when someone wins the lottery, it's not the end of their story; it's only the beginning. Not everyone can handle it. Could yoda? Let's catch up with yoda knows and see how it all turned out. Cannibal Kane was one of the recipients of the EVEmails. 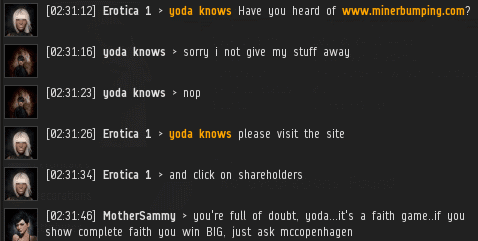 He was tired of having his inbox filled with such items, and promised to wardec yoda in retaliation. Though wardecs have been continually nerfed over the years, Cannibal is one of the few who keeps the art of wardeccing alive. 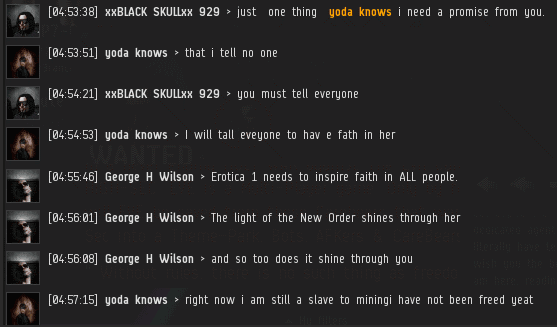 Several days later, Erotica 1 received an urgent EVEmail from Oman Darth, who claimed to be an alt of yoda. She was panicked. 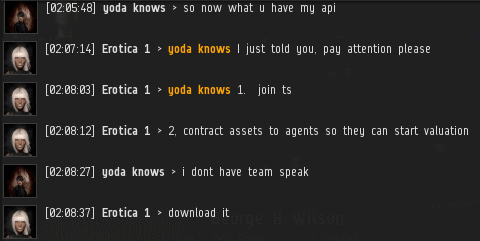 Cannibal was making good on his threat by wardeccing every corp yoda joined--including every corp yoda's alts joined. 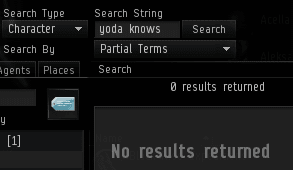 How did Cannibal know the identity of yoda's alts? Possibly this had something to do with the full API link that yoda had EVEmailed to everyone on the mailing list during the bonus round. yoda wasn't kidding. The Oman Darth character had joined The Guardians of the Beam earlier that day. The corp was instantly wardecced by Cannibal Kane. yoda knows felt she had no choice but to biomass herself. All of that effort to craft a proper, Code-compliant bio for the character was wasted. 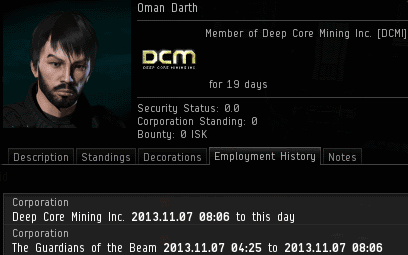 A few hours after joining The Guardians of the Beam, Oman was forced to leave the corp due to the wardec. Disappointingly, yoda lost faith in the Code and the New Order. She did not create a proper bio for her Oman Darth character. All of that money had gone to her head, and she'd forgotten that highsec is not meant to be risk-free. Rather than taking responsibility for her spamming of Cannibal's EVEmail, she evaded the wardecs and biomassed her beloved yoda knows. This should be a lesson for all of us. A carebear can hide her true nature for awhile, even for a five-hour bonus round. But sooner or later, the bot-aspirancy comes out. And with it, the fatal consequences. Does that mean we give up? Heck no. It just means we fight harder to save highsec. The New Order's intelligence network is vast. Most of our intel comes from highly-trained, highly-placed Agents all across EVE. Nevertheless, like any other intelligence network, we also allow random people to give us stuff. Stuff which is probably not useful. These people are called "walk-ins". Small Beer > Is it a disease? A random gentleman initiated a convo with Agent Small Beer. The convo began with a cryptic offer to give him "something". Small Beer was understandably skeptical. Small Beer > Which bit? Duumias Okanata > Callling James the "false prophet"
Mercifully, Duumias wasted no time in getting to the point. He linked an archived EVE-O thread from all the way back in March 2013. 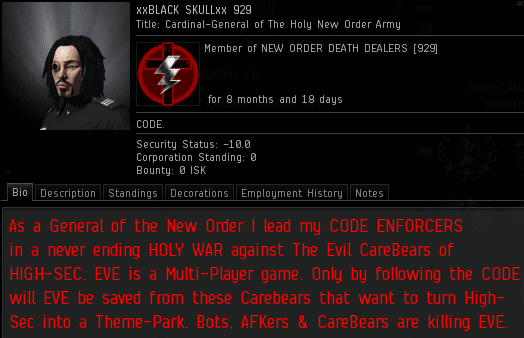 In the thread, xxBLACK SKULLxx 929 declared himself an enemy of the New Order. Those unfamiliar with New Order history may find this shocking. It's true: Originally, xxBLACK's NEW ORDER DEATH DEALERS corp was created to attack the New Order. But xxBLACK didn't need to spend much time in the asteroid belts and ice fields of highsec to change his mind. What he saw there was a level of bot-aspirancy that shocked and appalled him. To his amazement, the only good miners were the ones who followed the Code! xxBLACK SKULLxx 929 knew what he had to do. He vowed to slaughter as many bot-aspirants as he could find, and to force all the miners of highsec to obey the Code. And so the slaughter began. 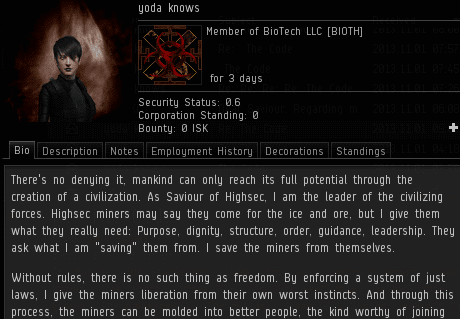 NODD joined CODEdot alliance and, in a matter of months, grew into the most deadly miner-ganking corporation in all EVE. No other group in highsec destroys as many bot-aspirants. Somehow, Duumias came across xxBLACK's eight month-old post and assumed it was fresh, high-value intel. Who was this guy? Small Beer invited fellow Agent John XIII into the convo to get more answers. John XIII > what seems to be the issue here? ...Oh boy. Duumias was our old friend, Ledrian Saisima. If you don't know who Ledrian is, you've got some reading to do. Several months ago, Ledrian, well... I'll just provide you with the links. Long story short, he was the subject of a rare five-part series on MinerBumping. ...But there haven't been any. 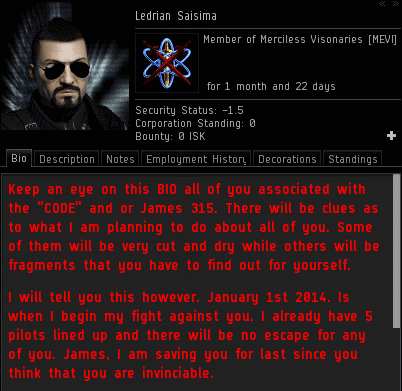 More recently, Ledrian popped up on the MinerBumping forum, claiming to be reformed and pro-Order. Small Beer > John, just wait till you've seen the evidence. The world of espionage is known for its shifting allegiances and double-dealing (not to be confused with isk-doubling). 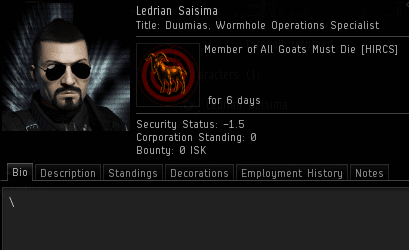 Ledrian, the notorious anti-Order spy, was claiming that xxBLACK, a man responsible for the deaths of hundreds of billions of isk worth of bot-aspirants, was a traitor. As rebels are fond of World War II analogies, this would be the equivalent of Tokyo Rose accusing the guys who nuked Hiroshima and Nagasaki of being deep-cover agents for Japan. Small Beer > Oh good grief. This is bad. John XIII > he mined or paid? It wasn't just the post from March that Ledrian had up his sleeve; he also claimed to have witnessed xxBLACK mining on an alt. Small Beer > Sweet mother of St Dominic Savio. Small Beer > I'm calling James, he has to know about this straight away. Ledrian's accusations were dynamite. If xxBLACK were really working for the rebels, anyone could be a traitor. Perhaps even James 315 was a mole. Small Beer wanted to send this information up the chain immediately. John XIII agreed that this was a serious matter, but he wanted to hear more. Duumias Okanata > Ever notice that he seems to know where to hit the best targets? Small Beer > Oh man, I don't think I want to hear this. Duumias Okanata > How easy it is to takwe them out? Then Ledrian slowly unveiled another bombshell. Small Beer went into screencapping mode. Before the day was done, the New Order would never be able to look at itself the same way again. "Imagine you were mining in nullsec and a hostile ship warped into the belt. Would you spend "maybe 20 seconds" to finish the sentence you were typing in Corp chat, or would you react immediately to the threat? Of course you'd react to the threat. Your sluggishness here is based on your perception that highsec mining is safe. Instead, in the same way you react to a nullsec threat, you should make it your number one priority to obey a command from an Agent while mining in New Order territory. "Even if you were speaking with your corp CEO, you should put that aside in favor of responding to the Agent. 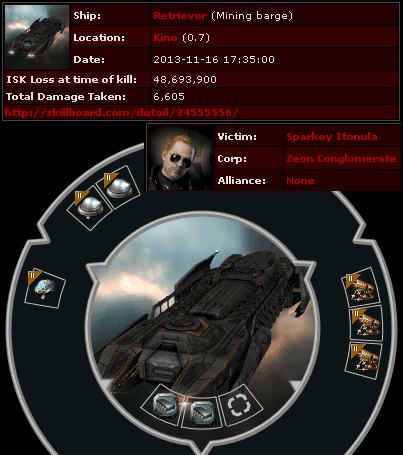 Remember, in highsec, any Agent outranks everyone in your corp/alliance. If you absolutely must speak with your corp without interruption, then you can always dock up." My rule of thumb is to require a miner to answer me within 5 seconds of being asked. After all, I'm not asking for them to write War and Peace or even to drop a "Praise James" in local. A simple two-character "yo" or "o/" or "o7" will suffice. For the miners of highsec, it all comes down to what their local Agent requires of them. Each Agent of the New Order is given the authority to to judge for himself or herself what is necessary to ensure Code-compliance. Agents like Krig Povelli, for instance. 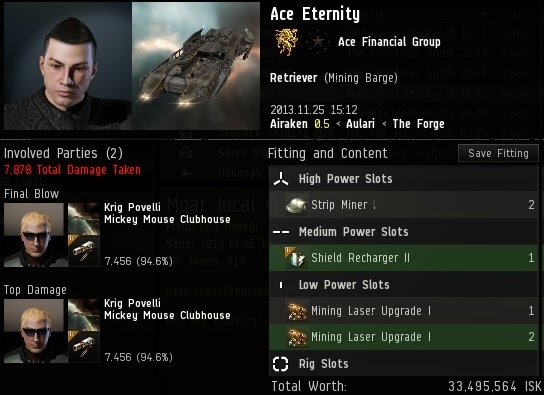 Krig Povelli > Ace Eternity are you AFK? Krig did a routine spot-check of an ore miner in one of the Airaken asteroid belts. Living up to his name, Ace Eternity took forever to respond. Krig was sitting next to him in a Catalyst. You do the math. Krig opened fire and outfought the miner. Without a ship to mine in, Ace left the system. The story might have ended there, with the happy ending I just described. However, the local miners were shocked by the death of their fellow oremonger, and they expressed their outrage. Josephine Sauveterre > Maybe you should be realistic and give people more than 40 seconds before you pass judgment? He might be off changing his kids diaper or something..
Runawae > to change a diaper ? It was your classic miner excuse. "What if I have to change a diaper? What if I have to help fix someone's plumbing?" Let's get real. The bot-aspirants who hoard isk and mine in contravention of the Code are not going AFK to save the world. They're probably pursuing their own selfish desires, just like they do in-game. Josephine Sauveterre > Do you also pay for other people's subs? No you're just another douchebag. If you've ever enforced the Code, you've probably heard miners like Josephine pull the "you can't tell me what to do unless you pay for my subscription" card. I've never understood it. Do they think The Mittani pays for tens of thousands of other players' subscriptions before he acts as leader of his coalition? 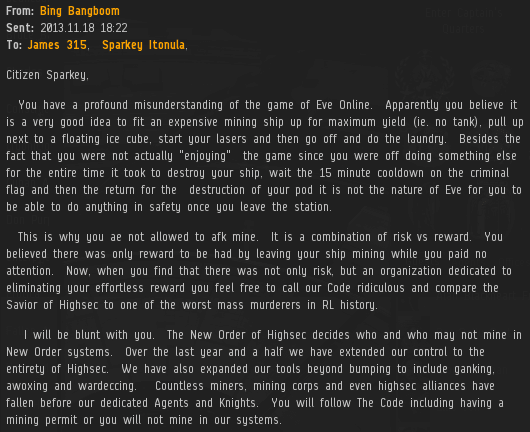 Or is a miner entitled to anarchy in highsec for some arbitrary reason? Krig Povelli > In what way? Josephine Sauveterre > You think you can dictate how other people play a game they pay real cash for? That makes you a douchebag. Josephine Sauveterre > Yeah you do that. Meanwhile, back in the real world. You're still a douche. Josephine Sauveterre > Of course you do. Douchebags seldom realize that they are douchebags. How can you tell the difference between an Agent and a tyrant? Both have total authority over the people they rule. What sets them apart is that Agents care about helping people, not about boosting their own egos. Despite Ace's giving him the silent treatment, Krig thoughtfully sent him an EVEmail about me and my teachings. So much for the "douchebag" theory. Josephine Sauveterre > Well, bot or not, 40 seconds is not reasonable. I don't log off my miner if my kid wants me to make her a sandwich, or if I want to go take a piss.. Since you don't realize that, you're just a douche. There's no honor or integrity in what you do. Krig Povelli > - Upon being suicide ganked, a miner should congratulate the ganker on his success. A "good fight" or "gf" in local is customary. Krig Povelli > where is my "gf"? Josephine attempted to continue the debate. She was at a distinct disdavantage. She had her opinions, but Krig was armed with the Code. And he wasn't afraid to use it. Josephine Sauveterre > I can tell you to f*ck off, that's about what you'll be getting. Krig Povelli > - Keep local clean. Miners should be courteous in local and should refrain from the use of profanity. Josephine Sauveterre > As a douche of the new order of douchery. Backed into a corner, Josephine had no choice but to return to her vulgarity of choice. She couldn't concentrate hard enough to come up with more excuses for AFK mining. Veronica Badasaz > as long as they obey the code omfg.. The rebel miners, carebears, and bot-aspirants of highsec may not admit that they respect us, but they do covet our power. To them, the ability to command a highsec miner is a sign of omnipotence. In their world, maybe that's true. For most, power tends to corrupt. Yet the Agents of the New Order have proven to be incorruptible. So when an Agent stops by and asks if you're AFK, you can be sure that they'll give you a fair, appropriate amount of time to answer. If you spend that time unwisely, you only have yourself to blame. I don't know what it is about miners who have the word "spark" in their name. In "How to Strike a Spark", we met a carebear named Spark2Universe who shed very large quantities of tears about his dead Hulk. We also witnessed a sizable volume of the same miner's tears in the follow-up post. Meet Sparkey Itonula. He lost his Retriever while illegally mining in highsec, and he was still quite sore about it a full twenty-four hours later. At this rate I'm going to run out of "spark" puns for the titles of these blog posts. Sparkey plead ignorance of the New Order's existence, despite having played EVE for three months. Apparently he'd been playing the game with all chat windows minimized, never went to EVE-O, never shared an EVEmail with anyone, ignored all convo requests, never read MinerBumping, and generally spent the last three months walking around with cotton balls in his ears. In three months, he never once set his mind to following the Code or praising me. 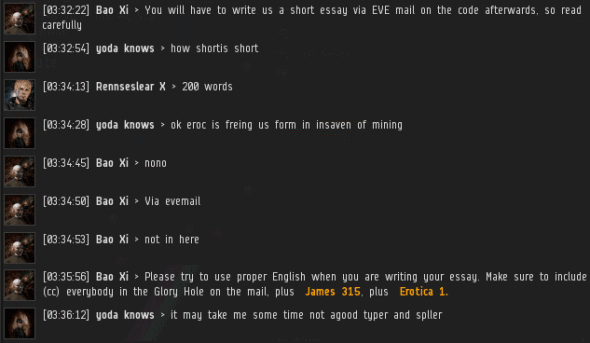 He even admitted to mining AFK in his EVEmail. Clearly, this was a miner who deserved to die. Agent Bing Bangboom came to the rescue and gave Sparkey some good news about the Code and how it applied to his new, post-Retriever life. Now the ball was in Sparkey's court. Unfortunately, he would drop said ball. 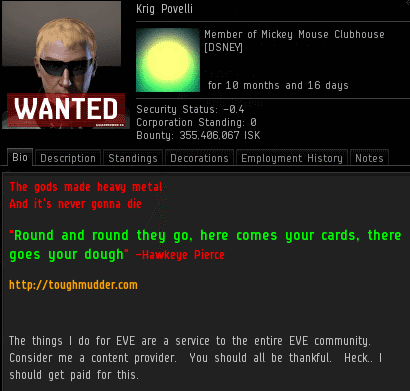 "Most EVE players view the highsec miners as a detestable, pestilential cancer. As Saviour of Highsec, I still find the strength to occasionally perform acts of mercy where the miners are concerned." "For instance, even when the miners spit vile insults at me in local, I do not respond in kind. Why not?... [I]f allowing the miner to vent his profanities toward me in local saves his wife or children one extra beating, that's something I'll gladly take. The miner has to take it out on somebody, and I'd rather it be me than some household full of children out there." Take note that nowhere in the Code does it describe all miners as wife-beaters or child-beaters. It merely explains that I allow miners to vent their anger at me, rather than responding in kind. 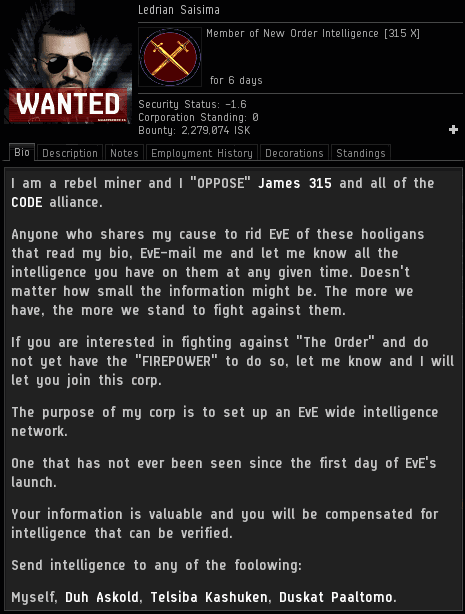 Highsec miners are often very angry people, a fact which is well-documented on this blog. Sadly, we can extrapolate that a non-zero percentage of angry miners mistreat their families. I wish that weren't the case, but the math tells us it must be so. Domestic violence is no laughing matter, and it's a shame Sparkey tried to use the subject to score some cheap points to advance his agenda. The New Order, on the other hand, will take no part in gutter politics. "Goofus whines in local after being suicide ganked. "To demonstrate your honour, you must pass one of the following three tests..."
How many tests does the carebear need to pass? One out of three! So one is a hundred and one? Talk about exaggeration. It's amazing how often carebear criticisms of the Code are based on misinterpretations of the Code. This is more proof of the perfection of our Code. Otherwise, wouldn't the carebears devote some of their time to making legitimate criticisms? More confusion on Sparkey's part. A dictatorship? Pshaw. Although I have absolute authority, the New Order is a representative democracy. In any event, I never claimed to control everything in EVE. Just highsec. I suppose the Hitler reference was inevitable, unless he was referring to some other German leader in World War II. More misunderstandings of the Code follow. Although it's true that I require the people of highsec to both obey the Code in their actions and agree with the Code in their thoughts, I would never try to make life terrible for those who disobey. How would the New Order accomplish that? By shooting at people's spaceships? If someone played an FPS, surely they wouldn't claim "life is terrible" when other players shoot at them. Thank goodness we have a regime in highsec that cares so much about the miners it governs. And thank goodness we have a Code that means what it says--not what a miner happens to feel like it means, on any given day. Erotica 1 has made quite a name for herself. 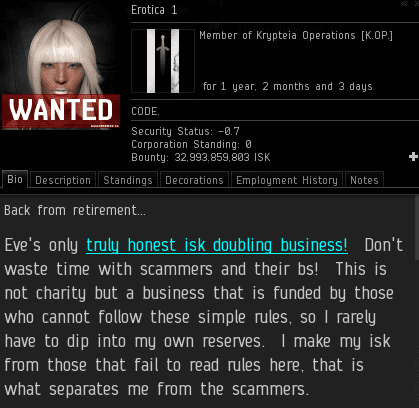 Over the last year, she became Jita's most celebrated isk-doubler and the New Order's biggest shareholder. Then she went into retirement. ...and then she came back from retirement. It's only fitting that a doubler would come back for a second time. 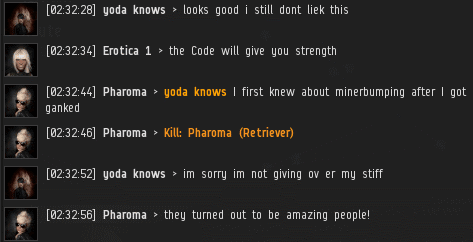 And yet, in the seedy world of Jita, controversy and rumors flow as easily as the isk. Some have questioned Erotica 1's integrity and decorum. Since she is the CEO of a CODEdot corporation, an investigation was in order. 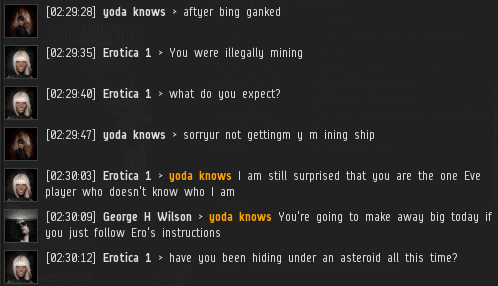 Highsec miner yoda knows had an alt ganked by an Agent of the New Order. 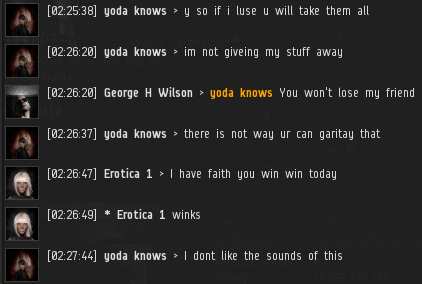 As recounted in a previous MinerBumping post, yoda was invited to Erotica 1's bonus room and won big. But what really went on in the smoke-filled bonus room? 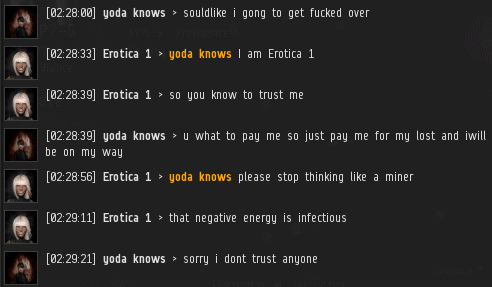 How are highsec residents convinced to hand over all of their EVE possessions to Erotica 1? And what happened to yoda afterward? In the interest of transparency, and to ensure that nothing untoward was going on in the bonus room (known as the "Glory Hole"), I delved into records that had been made about the yoda incident and sent to me by an observer of the bonus room. For the first time (well, not the first time, but roll with me on this), MinerBumping will take you behind the scenes to discover the secrets of Erotica 1's notorious bonus room. It began at approximately 01:50 EVEtime. Thanks to the time-stamping of the screencapper's chat, we can track the progress of this bonus room event. Roughly half an hour into the event, yoda knows had given away full API access to her account. But she resisted Erotica 1's appeal to transfer all of her assets, as is required in any isk-doubling bonus round. yoda did not yet have faith in Erotica 1. She was having second thoughts about the whole thing. How could Erotica 1 persuade her to give away her stuff? Rebels and skeptics would say that the bonus round participants are "bullied". We shall see. The source of yoda's reluctance was pinpointed. She was still suffering from shock after an Agent--apparently Bing Bangboom--destroyed her mining vessel. Erotica 1's decision months ago to purchase 24 billion isk worth of shares of New Order stock was a generous one. It also benefited her, because it gave her immense credibility in the highsec community. yoda was impressed by Erotica 1's shareholder status, but was still unconvinced. Pharoma jumped into the conversation with a different tactic. As someone who had lost a mining ship of her own, she could establish a rapport with yoda. Along those lines, George H Wilson came up with an analogy that just couldn't be denied. yoda was beginning to be won over by the logic. Maybe it did make sense to give the doubler her due. Forty minutes later, yoda had gone through and contracted all of her assets (including the mining ship) to the polite escrow agents who volunteered to facilitate the bonus round. Giving up her assets was only the beginning. Erotica 1 and the rest of the bonus room staff were eager to help yoda fully understand and embrace the Code. What methods would they use? And would they succceed? Highsec is continually gifted the benefits of a creative, inventive New Order. As soon as I heard Agent Kalorned was running a "police blotter" for the Gamis area on Twitter, I knew it would be a treat. 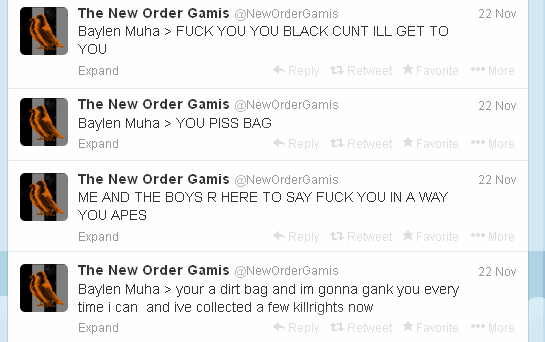 You can follow it yourself at @NewOrderGamis. Let's have a look! Modern technology is an amazing thing. Through the power of Twitter, we can watch highsec miners become more educated about EVE in real-time. 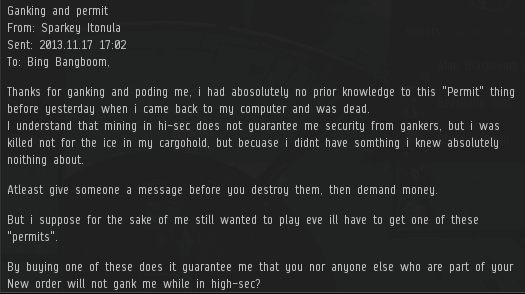 I should be banned from EVE because I care about highsec? Carebear logic. Kalorned also uses his feed to link chatlogs and YouTube videos. You can view his two recent gank videos, The Code Is Forever and its aptly-named sequel, The Code Is Forever #2. Miner Jacob Carter Torchwood has a warning for all New Order Agents. Actually, most of the time, we don't realize there's a rebel organization against us. ...Isn't "Anti-Code Intel" an oxymoron? 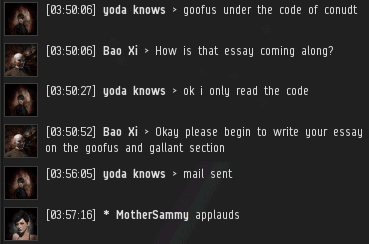 All of the intelligent people in highsec follow the Code. Some carebears are special. They prompt multiple tweets. Just the other day I was complimenting a miner for his creative excuse for mining without a permit, but Grummangy Otomeya takes the cake. "I wasn't AFK, I was just... fixing someone's plumbing." What's next, miners going AFK to save orphans from a burning building? Seriously though, if you do have a life-and-death emergency and don't have time to dock up, you can always quickly hit Ctrl+Q to leave EVE, rather than going AFK in one of my asteroid belts. Ever since Mine Teck uttered his bone-chilling threat of "I have kill rights, and I will use them," miners have gotten very excited about earning kill rights on those with -10 security status. Kalorned typically doesn't tweet his own responses to the miners, but you can infer them from the miners' responses to his responses. Incredible! You can actually play Miner Bingo through Twitter now! On the other hand, maybe we'll put less focus on the rebel blogs. Kalorned concludes his EVEmail with a suggestion. Should we use a New Order hashtag? EVE-related tweeters typically use #tweetfleet, and maybe the New Order ought to have its own, too. #minerbumping seems a logical choice. While you're at it, tweeters, give ol' @NewOrderGamis a tweet if you appreciate his fine work.